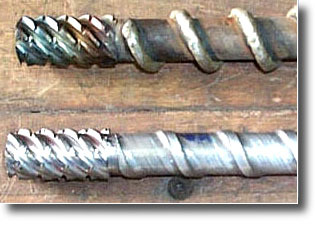 Screw Rebuilding -- We hard-surface, straighten, machine, grind,and polish to precision tolerances. Special hard-surfacing alloys are made with Nickel, Tungsten-Carbide and Molybdenum. Barrel Manufacturing -- Extrusion and Injection molding barrel with bimetalic inlays. Barrel Resleeving and Honing -- Partial resleeves up to 24 inches or honing to an even oversize dimension. Chrome-Plating -- On site by our sister company Central Florida Plating.